However, recent experiments have demonstrated that growth on vicinal substrates – surfaces that appear flat but actually have sparse, atomically small steps – can align the crystals and help them merge into a single, uniform structure, as reported on arXiv. A co-author of that report and leader of the Korean team, Feng Ding, is an alumnus of the Yakobson lab and a current adjunct professor at Rice. “I like to compare the mechanism to a ‘digital filter,’ here offered by the discrete nature of atomic lattices,” he said. “The analog curve that, with its slopes, describes a meandering step is ‘sampled and digitized’ by the very grid of constituent atomic rows, breaking the curve into straight 1D-terrace segments. The slope doesn’t help, but it doesn’t hurt. Surprisingly, the match can be good; like a well-designed house on a hill, it stands straight. 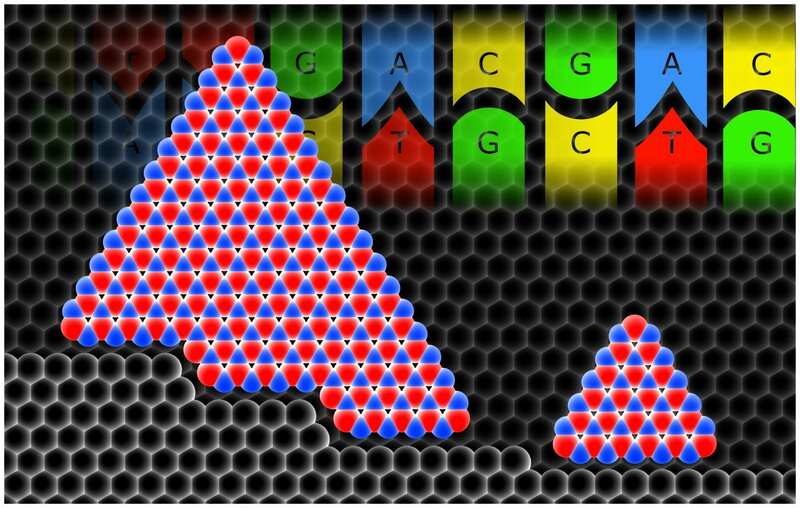 “The theory is simple, though it took a lot of hard work to calculate and confirm the complementarity matching between the metal template and the h-BN, almost like for A-G-T-C pairs in strands of DNA,” Yakobson said. It was unclear why the crystals merged into one so well until simulations by Bets, with the help of co-author and Rice graduate student Nitant Gupta, showed how h-BN “islands” remain aligned while nucleating along visibly curved steps. “They have this nice corner where the atoms will have more neighbors, which makes them happier,” Bets said. “They try to align to the steps and grow from there. Yakobson is the Karl F. Hasselmann Professor of Materials Science and NanoEngineering and a professor of chemistry at Rice. The U.S. Department of Energy (DOE) supported the research. Computer resources were provided by the National Energy Research Scientific Computing Center, supported by the DOE Office of Science, and the National Science Foundation-supported DAVinCI cluster at Rice, administered by the Center for Research Computing and procured in partnership with Rice’s Ken Kennedy Institute for Information Technology.